Shh! Quiet. Roger is reading. Roger is reading a book. If you have ever lived in an apartment or tried to read a book or attempted any task in the presence of small children, then you can relate to Roger is Reading a Book by Koen Van Biesen. Published in English by Eerdmans Books for Young Readers, Van Biesen’s illustrated delight features the eponymous Roger trying to read while his neighbor, Emily, enjoys hobbies of her own–loud hobbies. The illustrations are simple and sumptuous, a combination of intricate line drawings and digital photography. The lines are repetitive but enjoyable and leave much of the action in the mind of the reader. The message of the book is clear–in order to have a good neighbor, one must be a good neighbor. And that is a lesson that we can all stand to hear again, especially when it is expertly executed by a skillful wordsmith and illustrator. Now, if you’ll excuse me, Josh is reading a book. I was visiting the library with a writing pal of mine when I saw this alphabet book. There were three things about it that made me want to bring it home, but we’ll get to those in a minute. 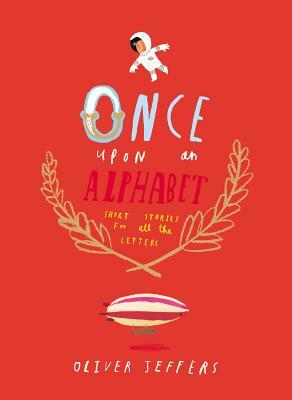 Once Upon an Alphabet is a different type of alphabet book. Instead of the traditional “A is for Apple” book that gives each letter a page and employs a simple rhyming structure, Oliver Jeffers’ contribution to the genre is a book of flash fiction stories. Being a sucker for flash fiction, I’m predisposed to like this book. It is a hefty book. It literally stands out among the other books on the shelf because of its size. Once Upon an Alphabet is noticeably larger and thicker than other books. Simply from an economic point of view, you’d get your money’s worth out of it. It is gorgeously illustrated. Jeffers has a simple style that plays well with his short story format. You may recognize the illustration style due to his other, more popular book, The Day the Crayons Quit. Good stuff. It is self-referential. Each story showcases a different letter of the alphabet and most of the stories stand alone, but not all of them. By referencing stories from the early letters in the later letters, Jeffers creates a feeling of being on the inside of an inside joke. Readers who skip ahead to the late letters won’t get it, and that’s the point. So maybe the next time you are at the library or indie bookstore, you could ask them about Once Upon an Alphabet. Back in the days of my youth, I collected and played with Micro Machines. They are some of the few toys (aside from my Lego collection) that I retained into adulthood. For those who don’t know what I’m talking about, Micro Machines are miniaturized versions of popular vehicles about as big as your thumbnail, much smaller than Hot Wheels or Matchbox cars which are scale models about as big as your thumb. But I’m not here to talk about Micro Machines. I’m going to talk about Nanoblocks. 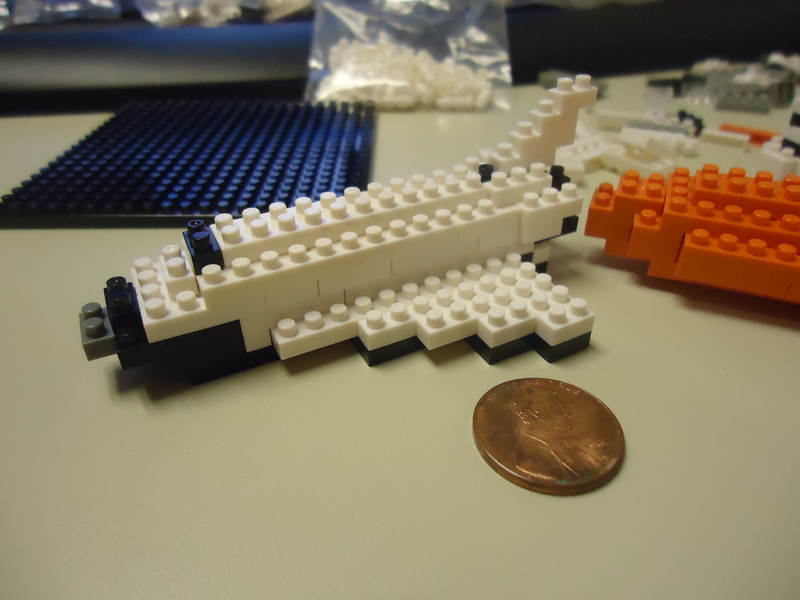 I was just setting up the comparison to say that Nanoblocks are to Micro Machines what Nanoblocks are to Lego. Anyway, a couple of weeks ago my dad called me up to ask for my opinion. He runs a hobby shop in Grand Rapids, Michigan and he was curious whether he should stock Nanoblocks or not. So he handed me this set and asked me to put it together. In comparing it to Lego sets of comparable box size and price, Nanoblock sets have about 10 times more pieces. That is both a blessing and a curse. It is awesome because the more pieces you have, the more options for customization you have. So once you’ve built the set once, you can take it apart and build a bunch of other stuff from your imagination from the same set of pieces. The downside is that if you drop a piece, you may not find it. Never attempt to build a set on a thick carpet. You might as well just open the package and dump the little pieces into your vacuum cleaner. The sets take a bit more desk space while building, but less when the set is finished. When you set out to build, it is a good idea to clear about two square feet for sorting little pieces. When you open the box, the pieces are contained within several bags. Sadly, the bags are not split in a logical way between steps or sections (e.g. the space shuttle, the booster rockets, the launch pad), so you end up opening all of the bags and then you have to keep track of 500 little pieces. They take time to assemble, especially if you have fat, sausage fingers like me. To give you an idea of how long it can take to build one of these sets, I spent about an hour or so in building the shuttle, tank, and booster rockets over the course of three lunch hours. I haven’t even started on the launch pad yet. People with more nimble fingers than mine would probably have an easier time of it, however. If you aren’t able to finish a set in one sitting, be sure to invest in a resealable bag to store the pieces. The instructions are less of a step-by-step guide and more of an exploded view of the different layers of each model part. This took me a while to figure out because I am used to the Lego instruction books that dedicate a page each to adding one or two pieces at a time. The Nanoblock instructions take up less room, and though it was an adjustment, it didn’t take long to figure out. They make good desk art. Where Lego sets are primarily aimed at a younger audience (I recognize that in spite of my love for them, I am not their target), Nanoblocks seem to be aiming at an older crowd. In fact, I’d be willing to bet that most of these sets will end up on some professional’s desk instead of in a youngster’s toy box, that is, if they don’t end up in the vacuum cleaner first. On a scale of 1 to 10 where 1 is stepping a Lego and 10 is completing the coolest Lego set ever, I’d rate the Nanoblock experience as a 7. It was a challenge and rewarding to build. I’m happy to have the completed set on my desk. And if I ever want to break down my set, I know that I could build a number of other things with the 500+ pieces (instead of limited number of things that you can build from a single Lego set). This is part of the set I built in comparison to a penny. Imagine a world on the fringes of our own where imagination can create real things. Now allow me to tell you that such a world exists (possibly because you imagined it) between the covers of Brandon Mull‘s Five Kingdoms series. In Sky Raiders, the first of the series, Cole follows his kidnapped friends into the Outskirts, made up of five kingdoms and populated by mysterious powers and people. It isn’t long before Cole is marked as a slave and drafted into the dangerous service of the Sky Raiders, a cross between flying pirates and a salvaging crew. With flying castles, magical objects, and a mysterious power running rampant in the Outskirts, Mull knows how to create a captivating fantasy world. This should come as no surprise to readers of his previous series, Fablehaven (reviewed here) and the Beyonders (which is next on my reading list). In Five Kingdoms, Brandon Mull seems to borrow some familiar fantasy elements (flying ships, pirates, and swords from Peter Pan, magical objects from the Brothers Grimm, and a ragtag group of misfits from every teen fantasy ever written), but he infuses them with new life and wonder. Sky Raiders is a quick-paced adventure and a delightful read. I highly recommend it for anyone interested in teen fantasy in general and well-written teen fantasy in specific. I don’t remember when I first read Michael Ian Black’s essay “What I Would Be Thinking About If I Were Billy Joel Driving Toward a Holiday Party Where I Knew There Was Going to Be a Piano.” What I do remember is loving it. So when I happened upon Michael Ian Black’s book, You’re Not Doing It Right, I had to pick it up. Michael Ian Black is a very famous actor, writer, husband and father. It doesn’t matter that you may not know who he is. In spite of his fame, Michael Ian Black’s experiences and humiliations are common to most men. In fact, aside from being older, more famous, thinner, funnier, probably wealthier, and less religious, we could be twins. Well, also my parents didn’t divorce because my mom was a lesbian. They divorced for other reasons. But Michael Ian Black and I both experienced vertigo, so we’re essentially the same. Black’s book, You’re Not Doing It Right, is a frank memoir of the actor’s life and failures. Imagine sneaking into your sibling’s bedroom and stealing their diary, that one labeled “Keep out!!! This means you! !” and taking into the bathroom (so you can lock the door behind you) and reading all of their secrets. If nothing else, you won’t be able to look at them in the same way thereafter. That’s what it is like to read this book, but in the best way possible. Michael Ian Black’s book is nothing less than a sledgehammer for whatever pedestal you have put him on. It is an invitation to stop feeling crazy and know that there are people (even very famous people) who struggle with selfishness in marriage, frustrations in parenting, and relationships in general. True, it was utterly unlike any memoir that might have passed my desk at a Christian publishing house, but that is one of the reasons that I read it. If you can get past some colorful language and a potentially sordid history (let’s be honest, none of us are proud of every part of our history), you can’t go wrong with You’re Not Doing It Right.